Bigler was born in Pennsylvania in 1805. In Pittsburgh he was a printer’s apprentice before becoming an editor for the Centre County Democrat. Bigler edited at the newspaper for five years, from 1827 until 1832. He went on to study law and was admitted to the bar in 1840. He practiced law in Pennsylvania and later in Illinois. In 1849, Bigler and his family traveled overland from Mount Sterling, Illinois to Sacramento, California. Bigler began his career in politics when he was elected to the Assembly in 1849. In his second term in the Assembly, he was elected as the Speaker. In May 1851, Bigler was nominated as the Democratic candidate for Governor. He narrowly won the election by a margin of 1,082 votes. Bigler was re-nominated in 1853 and was re-elected by a tighter margin–only 636 votes over his opponent. 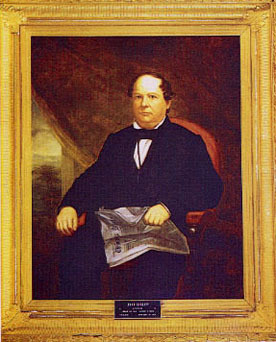 The 1854 legislature honored Governor Bigler by naming a lake after him. However, in 1870 Bigler Lake was renamed Lake Tahoe. After his terms as Governor, Bigler was appointed as the Minister to Chile by President James Buchanan. In 1867, Bigler was appointed to the Railroad Commission. Bigler was one of the founders of the State Capitol Reporter; he served as the paper’s editor until his death. Bigler favored and encouraged emigration from the east. He was dedicated to improving the living conditions of the new emigrants. He was instrumental in creating emigrant stations east of the Sierra Nevada to help struggling travelers. He garnered much of his political strength from these groups. Bigler was ill for several months before he died of dropsy in 1871 at age 66. Use the California State Library’s interactive tool to view Executive Orders and Proclamations signed by Governor Bigler.